My friend PinkPolkaDot has posted her regular food quiz – if you would like to take part, please take a look at her blog 🙂 Here are my answers to Friday’s Food Quiz Number 52. 1. What is the main ingredient of peperonata? 3. Which vegetables is part of the Brassica family? 4. What does it mean to knock-back dough? 5. Are Scallops also called Baby clams? 6. Where did Jambalaya originate from? / What is jambalaya? 7. Beetroot are the family of which other vegetable? 8. 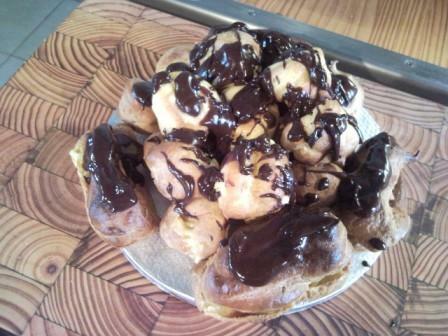 What type of pastry is used to make profiteroles? 10. What are the two main ingredients of carbonnade and from which country does it originate? Please see this week’s Something Sweet Challenge – you stand a chance to win a Le Creuset set of cassis rectangular dishes – 1 x 26cm and 1 x 19cm valued at R398. See the competition page for more details. Taleggio..a beautiful cheese, but ohhh it makes your kitchen stink! No one seems to mind when they eat it, the flavour is yummy….but you need to close off the kitchen and open windows and doors….smelly wet socks come to mind! we are back from France 🙁 I loved our holiday and the food! I’m not sure about n° 10 but I believe you on the others!